*Comes in the original box. *The soles are dirty and have some scratches. Euro brands have a reputation for cobbling slim, sculptured shoes that remain tantalizingly off-limits to cyclists not blessed with the delicate feet to match. Before you write off Euro brands completely, slide your foot into the Sidi Ergo 4 Carbon Mega Shoe and experience a slipper with expert European construction and a platform that actually accommodates your taller instep and wider-than-average forefoot. 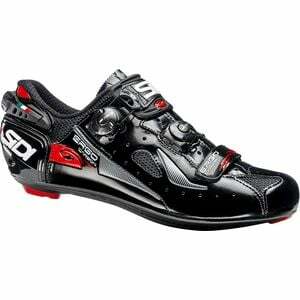 Sidi blends beloved features from throughout its line to create the Ergo 4, so if you're familiar with the brand, you're likely to recognize things like the Tecno 3 buckle system and Adjustable Heel Retention Device. The Tecno 3's dual ratcheting buckles provide micro-adjustability across the length of your foot for a contoured, secure fit that works for your foot. A wider platform shouldn't translate to a sloppy, loose fit, and Sidi unsurprisingly succeeds at striking a balance between the two with the Ergo 4. To match the heel of the shoe to your foot, tighten or loosen the adjustable heel to establish a secure fit that won't slip or waste power when you stretch out of the saddle mid-climb. Underneath, the full carbon composite sole handles power transfer, creating a rigid medium through which to transfer power from the engine to the frame. A full carbon shank surrounded by nylon-reinforced carbon achieves a balance of slight flex for comfort with uncompromising rigidity during punishing efforts.